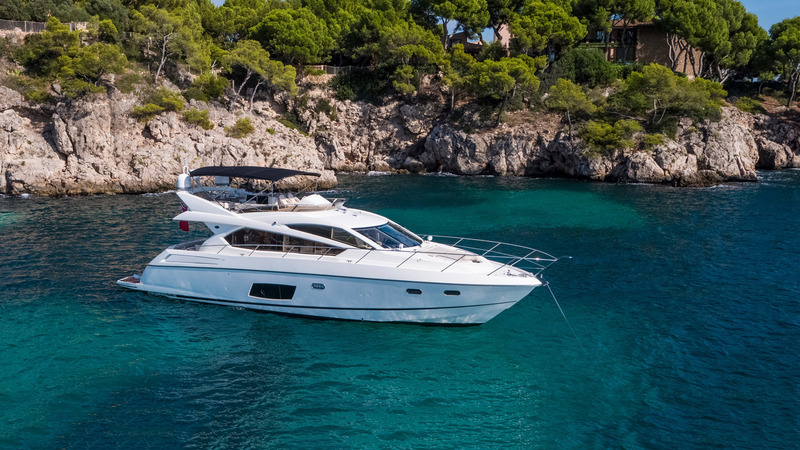 Able to welcome up to eight guests, like all Sunseeker designs Imolyas boasts generous proportions with plenty of onboard space for her charter guests to enjoy. Her four guest cabins include two doubles and two twins, including a large master and VIP that are both ensuite and with full entertainment systems. Imolyas’ welcoming interior features American walnut finishes, paired with oversized windows for a light and bright feel. The main saloon is a large space that includes lounge seating, a 55’’ retractable TV, dinette and a modern open plan galley. The main saloon leads directly out to the covered aft deck, which is home to a full dining table. Stepped access leads seamlessly down to the large swimming platform and inviting waters.